Peter Popoff. Appropriately named for sure. Mr. Popoff had a tendency to pop off with some might high falutin' messages. He may claim to be a prophet, but compare his activities with the Bible and decide for yourself. 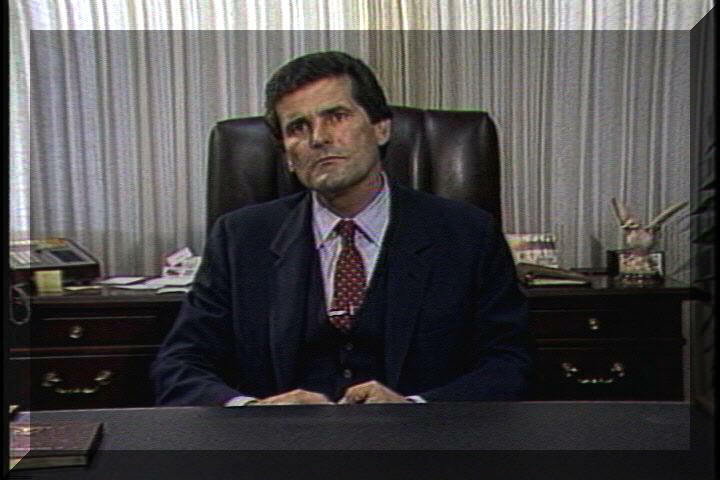 From the introductory page of the Peter Popoff Website. Notice the miracles mentioned are not about how God changed the life of someone who was lost but are about money. Multiplied thousands have turned to Christ. We have carried the message of Jesus Christ and Super Living to millions here in America and around the World... let us help you today. YOUR SPECIAL PRAYER HELP WILL ARRIVE IN YOUR MAIL BOX... YOU DON'T HAVE TO GO ANYWHERE! Each prophetic message that comes from Peter Popoff will have insights and directions that will show you how you can move up to a new level of ABUNDANCE. 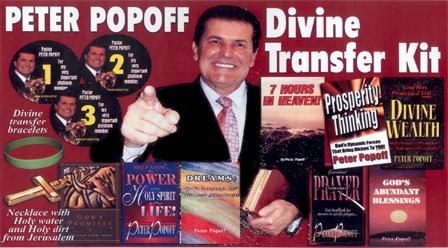 Peter Popoff passionately believes the Lord is the hope of His people. He seeks God daily for the answers to your unsolved problems, healing for your illness, power to defeat poverty and the wisdom to overcome fear, guilt, suffering and condemnation. The Awesome Story of a REAL LIFE MIRACLE! The Lord blessed us just as you prophesied with over $30,000. "Through this ministry God has performed many miracles, many healings. He has opened our spiritual eyes. God has filled us with so much, because we are part of this work... How we thank Him for putting us in touch with His prophet, His teacher, His anointed servant. We're not praising the man of God, put praising God for raising up a prophet that tells us the truth. GOD DID IT AGAIN! The Lord blessed us again just as you prophesied in you anointed letter. This year we have been blessed with over $18,000. This is money that came I miraculously to us and was over and above our regular income! Each letter you send is a great joy because we know that it is a message from the servant of the Lord. You speak the Word and it comes to pass. You are a vital link to us and God, because He speaks through you. Through this ministry God has performed so many miracles, many I healings, much spiritual growth... You are a holy man an Elijah to this family. How we thank Him for putting us in touch with His Prophet. LET REV. POPOFF LINK YOU UP WITH... THE POWER FORCE THAT BRINGS RICHES TO YOU! It's shocking... because the shocking truth about prosperity is that it is shockingly RIGHT and NOT shockingly wrong for you as God's child. It is God's will for you to prosper. ONE OF THE MOST powerful principles you can use to receive "GOD'S ABUNDANCE" is a principle God Himself uses... it's the principle of sowing and reaping. The Shocking Truth about MONEY...! I say God wants YOU RICH... "rich" means having an abundance of all that you need to live a fuller, richer, more satisfying life. HERE IS A MORE SHOCKING truth. The Holy Bible is filled with rich promises regarding your prosperity, as a child of god. THAT'S WHY WE WANT TO TAKE YOU INTO "God's Very Best"
I am sure you know the story of Jacob wrestling with the angel until the break of day... CAN YOU SEE HOW THE POWER OF PERSISTENCE PRODUCED SUCCESS IN HIS LIFE? "I WILL NOT LET THEE GO, EXCEI>T THOU BLESS ME." Gen. 32:36 The angel renamed Jacob ISRAEL... meaning the PRINCE OF GOD. The situations you are now wrestling with... did not just happen. It has (whether you realize it or not) taken years for you to get into some of these predicaments. HOWEVER, you will discover that as you face your disappointments, hurts and setbacks with PERSISTENCE and Faith in God's Word... You will never fail to see amazing things happen. As we work with God's principles each month... in time things will begin to turn around in your life. It is a process that works. Holy Gee Wowzers Batman! Take a look at the picture below. In the bottom left corner Popoff advertises "Necklace with Holy water and Holy dirt from Jerusalem. Holy dirt? I sure hope the vial doesn't break or you may end up with a mud necklace. I didn't know Popoff was a catholic. I know I sure do not have any Holy water around my house or Ministry. Do you? This man will say and do anything for a buck. You don't think that cheesy grin on his face is from eating too many cheese puffs do you. I have to be honest with you, he reminds me of a used car salesman in this picture, or better yet, one of those late night infomercials you see on TV. This came right from his website folks, I ain't making it up. Beautiful Cross Necklace Personally Brought Back From Israel By Rev. Popoff Filled with Holy Land Soil and Water. Rev Peter Popoff I am so glad that we are in contact with each other, your prayers for us is a blessing, one thing I have been asking the lord for was a home, thanks to you for all of your prayers my wish came true. I now have a home of my own and that's not all my husband received a $302,000.00 check in the mail the other day unexpectedly. You told me in the letter that miracle money would come true and it has. Thank you so very much for all of your prayers god is good and he has blessed me tremendously . My daughter…is in her 4th year for Nursing. I put the red string above her front door. She told me her husband's uncle sent them a cheque for $48,000.00 to pay off all her university schooling debts! Praise God! --Sis B. Roberts, Richmond, BC I guess the red string is what did it. Thank you for your prayers. Last week I found out that I had an account with enough money in it to pay almost all of my credit cards. This was a total surprise to me. Thank you again for praying with me. --Sister C. Bercier, Vanier, ON Canada Now tell me, how many people have a bank account that they forgot about? And, not only a bank account, but one with enough money sitting in it to pay off most of her credit card bills? She must have had awfully small credit card bills because I am sure that she received a statement from the bank each month stating what her balance was, so where did this account appear from so unexpectedly. This is just the beginning of the Peter Popoff page. Please stay tuned for updates coming shortly.